I knew I had screwed up after I had trailed the hit buck to a second bed within 100 yards of the first and found only a small smear of blood in the flattened grass and no discernible blood trail after that. The smear was toward the rear end of the body-shaped imprint in the grass, indicative of an arrow hit too far back in the body. When I saw the hit buck stagger out of sight with blood pouring like water from a faucet, I just knew that even though the hit appeared to be a bit back, the buck still would be down and out in short order. Hunters, myself included, can be incurable optimists. Of course, I was wrong, and my first mistake had been immediately climbing out of the tree stand to follow the blood trail of what I had reason to believe was a gut-shot deer. A slight ridge topped out 40 yards above the stand, and as I eased over the edge fully expecting to see a dead deer, instead I saw the buck bedded about the same time it saw me. Before I could get to full draw, the deer was gone. At the abandoned bed I saw a good amount of blood but then no more until a few droplets that had been jarred off where the buck had jumped a woven wire fence some 40 yards from that. I should have backed off, but I circled out ahead to try and find more blood. That’s when I found where the buck had bedded again but then evidently saw or winded me trailing and left again. There were only a couple droplets of blood in this bed, and I finally accepted that if I wanted to ever recover this buck, I had better back off. Back at camp that evening, the outfitter wanted to go out immediately and try to find the deer in the dark, a plan I vehemently opposed. I’d shot the buck about 10 a.m., and he figured it would be long dead. However, with many years of guiding experience under my own belt, I knew that the accepted notion that six to eight hours was plenty of time to wait before trailing a gut-shot deer was a crock. Early on, I lost several animals following this rule, and it wasn’t until I started guiding antelope bowhunts that I learned how to increase the chances of recovering even superficially hit animals when conditions are right. The open sagebrush and semi-arid country of northwestern Colorado where I guided made it possible to observe hit and wounded antelope in a way that is typically not possible with other big game. I would not call my observations scientific study. However, I trailed more than 200 antelope hit by myself, clients and friends, and that experience combined with what I also learned while hunting deer, elk and bear over the same extended period did give me some insight. Antelope may be the most beautiful and graceful of big game, but they also are as tough and tenacious as any of their four-footed brethren. This night, I held my ground over the objections of the outfitter and would not go look for the big buck. When everyone in camp was done hunting the following morning, more than a full day after my arrow had passed through the buck, I finally brought two compadres back to the stand to help me hopefully find the deer. The basics of blood trailing are to find the first blood, then the second, third, and so on until you find the animal. Simple enough, but when a wounded critter doesn’t leave any blood behind, as is quite often the case, things get a bit more complicated. An hour of searching all around this hit buck’s second bed didn’t turn up a single drop of blood, so we spread out and began a systematic grid search of the area. Two hours later, we found the buck on a small ridge a half-mile from where I had shot it. We also found six more beds within 20 yards of the buck, none of which held more than a few drops of blood. Judging by the relatively warm body, the buck had not expired until a few hours prior to our finding it. Had we tried to trail that buck in the dark the evening before, our lights and blundering around undoubtedly would have caused it to sneak off, and with the adrenaline still coursing through its veins, it might have gone a mile or more before bedding again, perhaps in an unlikely hidey hole. The arrow had sliced through an edge of the liver and the bottom of one lung, yet that tough old buck had lasted 20 hours or more. When you lose the blood trail, a grid search may be the only way to find the animal, and if you have given it time to expire nearby, it often works. In contrast to the long-standing belief that it’s best to wait a half-hour before trailing any deer hit with bullet or arrow, I’ve also learned that while you may not want to push a deer in the dark, when you have the daylight, it’s usually best to get on the trail as soon as possible. After you study the sign, then you can decide what to do next based on what you determine. I once accused Fred Bear of fostering the 30-minute misconception because early in his career he was a heavy smoker, and after shooting a deer with bow and arrow, he would take the time to smoke a couple of cigarettes and settle down before taking up the trail. Since he usually found a dead deer at the end of the trail, he figured this must be the ideal time to wait. I think his success at recovering animals had more to do with his ability to put arrows through their vitals. But because of Fred’s iconic stature, his questionable theory became ingrained in the world of bowhunting and then gun hunting, too. Over the years, I’ve been in on the recovery of literally hundreds of big-game animals that were leaving a heavy blood trail after being hit with an arrow or bullet. Because we kept many of these animals moving, I believe we maximized the blood loss and also the other effects of the hits, to the point of being able to recover the animals. Sometimes we recovered animals that I am sure would have been lost any other way. I once stayed on the trail of a South Dakota whitetail buck for five hours and covered more than 3 miles of river bottom before being able to stalk within 30 yards of the bedded animal and make a killing shot with the bow. The first hit had passed through a shoulder when the buck jumped the string. While I knew the vitals weren’t penetrated, the blood trail was obvious, not copious amounts of blood, but enough so I could trail at a steady pace. After several hundred yards, the buck bedded in a thicket. As I approached, I saw it sneak out of this bed and then across an open area into a pocket of timber. I cut across and jumped the deer again out of a second bed, again forcing it into more open country where I could maintain visual contact. By keeping the buck moving, I was preventing the shoulder wound sealing. The blood trail continued, and loss of that blood was taking a toll. The weakened deer finally bedded in a small plum thicket. This time, it didn’t even get up as I walked to within 30 yards for the killing shot. Think back to the number of times you have waited the prescribed half-hour and then followed a decent blood trail to where the deer had bedded down. But from that point on, the blood trail was light or you found no more blood. When an animal is hit, the adrenaline rush provides strength and stamina for an initial burst. Then the brain starts producing endorphins, endogenous peptides that bind with opiate receptors to provide pain relief, similar to a shot of morphine. In Mother Nature’s world, recuperation immediately follows survival. So, the hit animal beds down and starts healing. Giving that bedded animal a half-hour or more to recover doesn’t make sense to me. The notion that it will stiffen up and bleed out faster is pure hokum. When the animal beds, blood flow actually slows, and coagulating blood starts sealing the wound. The increase in endorphins also heightens the animal’s awareness. The wounded critter is more than likely well aware of you on its trail or searching the area. And by the time you start to get close, it has recovered enough to sneak out of the bed with minimal noise and exertion, lessening the chances of re-opening the wound and also the likelihood that you will see or hear it leave. Given enough of a head start, that wounded deer will probably never be seen again, dead or alive. All of this being said, I never pursue a critter in haste, and if I know an arrow or bullet hit too far back, or if what I find at the site leads me to believe the animal was gut-shot, I back off and leave the area as soon as possible. I’ve found that when a gut-shot animal is not disturbed, it will generally sicken and expire in the immediate vicinity of its first bed, which may range from within a few yards of where it was initially hit to a few hundred yards. 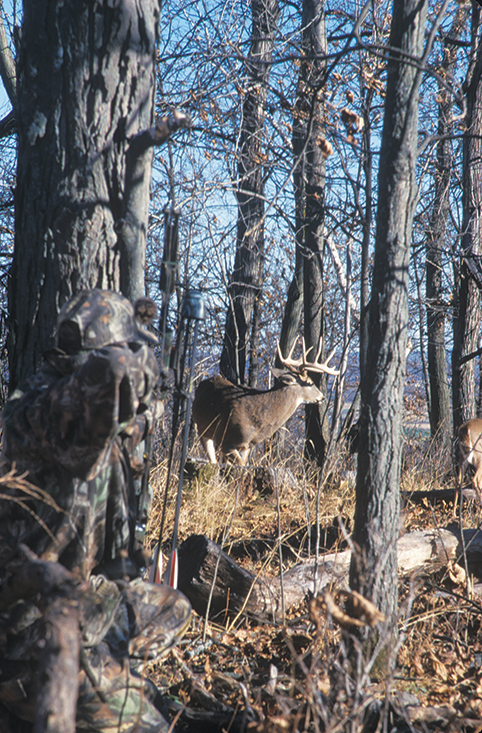 Nine times out of 10, you will find that gut-shot deer nearby if you just leave it be for a minimum of 24 hours. When you see a gut-shot animal bed within sight of your stand or blind, my advice is to stay put until you believe you can slip out of the stand without disturbing the animal, even if that means waiting for the cover of night. A client in a tree stand once gut-shot a bull elk at a waterhole. The big bull simply walked 40 yards into the ponderosa pines and then bedded down within plain sight. The client radioed to tell me what was happening, and rather than drive in to pick him up at dark as was normal procedure, I told him to stay put until it was pitch black and then sneak out of the stand as quietly as he could, leaving all of his gear behind. The next afternoon, we found his trophy bull dead, within 50 yards of where it had first bedded. I am equally adamant about going after any animal shot late in the evening if the hunter feels he made a good hit and can pinpoint where the animal was last seen. If we find blood, we quietly trail it for 200 yards or so. But if we don’t find the animal dead within that distance, we back off for 18 hours or more. Then we return to the trail. Yes, we lose a few of the animals we leave for the night, mostly to coyotes. But we recover many, many more. 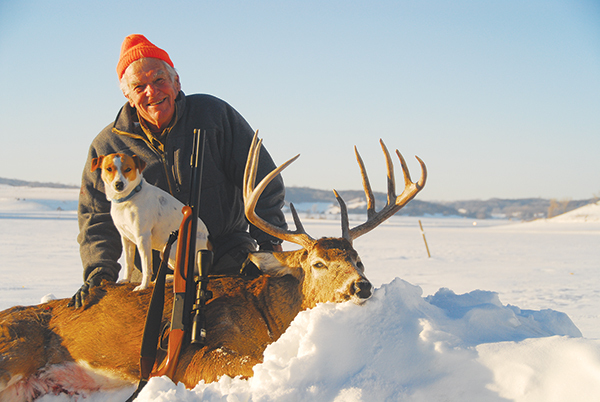 During the last Iowa deer gun season, a client shot a trophy buck from a stand over a food plot. He hit it just at sunset, and by the time my grandson Cole (also an experienced guide) got to him it was pitch black. The hunter took Cole to where he hit the buck, and after a thorough search, Cole finally found a few splashes of blood and a small fragment of the 250-grain muzzleloader bullet. Then they quietly left the area and returned to camp. The following afternoon, we found the dead buck 200 yards back in the woods, bedded on a hillside overlooking the wooded draw. The deer had expired no doubt watching its back trail for pursuit. Had Cole let enthusiasm and optimism override common sense and experience, had he followed that buck, it undoubtedly would have slipped over the ridge and been long gone. Nobody likes to make a bad hit, yet it happens. Letting the animal die in the field is certainly not ideal, either, but it is better to recover the animal later than to waste it altogether. Let that bad taste in your mouth motivate you to work harder, to master your hunting, shooting and especially tracking skills—including learning and than becoming proficient at what to do after the hit. Judd with his new best friend. A blood-trailing dog can be a great help recovering hit animals, and states that don’t allow dogs for hunting deer often do allow them for this work.